I came up with the idea for this recipe on a day when I had planned to make traditional stuffed shells for dinner, but realized what I had in my pantry was the little pasta shells and not the big shells for stuffing. Grrrrr. I had bought all the other ingredients at the store earlier that day, and I was determined to make it work anyway. So I decided to do an inside out /casserole version, and I have to say, it turned out truly fantastic. I may never go back to making traditional stuffed shells again! It was a lot faster and less tedious than stuffing shells. Each big and hearty portion is just 8 Points – not bad for a dish made with pasta and three different types of cheese. The whole family loved it, and it made for great leftovers. Definitely a Weight Watchers Casserole Recipe to add to you repertoire. Enjoy! 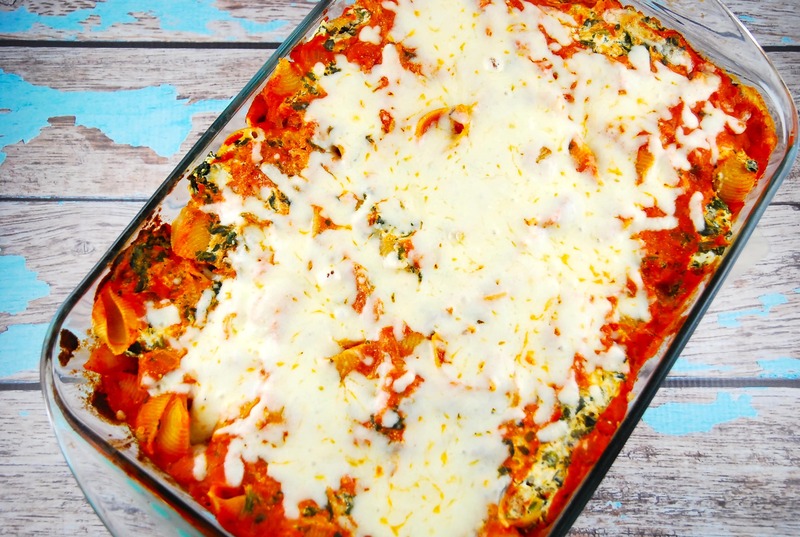 So comforting and satisfying, this casserole version of a classic stuffed shells recipe is a lot quicker to prepare, but just as delicious. Decadent and filling, it’s a perfect family meal. Prepare pasta according to package directions. Drain pasta shells, then add in the marinara sauce and mix. In a medium sized mixing bowl, combine ricotta, egg white, spinach, garlic, parmesan, parsley, oregano, basil, and salt & pepper, and mix well. Mix 1/3 of the ricotta mixture in with pasta. Spray a 9” x 13” baking dish with nonfat cooking spray or an olive oil mister. Place 1/2 of the pasta into the prepared baking dish. Drop spoonfuls of the remaining ricotta mixture evenly on top of the pasta shells. Top with remaining pasta shells. Sprinkle evenly with the shredded mozzarella. Cover with foil, poking a few holes for steam, and bake in oven for about 25 minutes. Remove foil, and place back in oven for another 5 minutes until cheese is melted, and bubbling.